Oktoberfest 2017 Events in the UK! Oktoberfest, the most famous beer festival in the world, holds an important place in Bavarian culture. 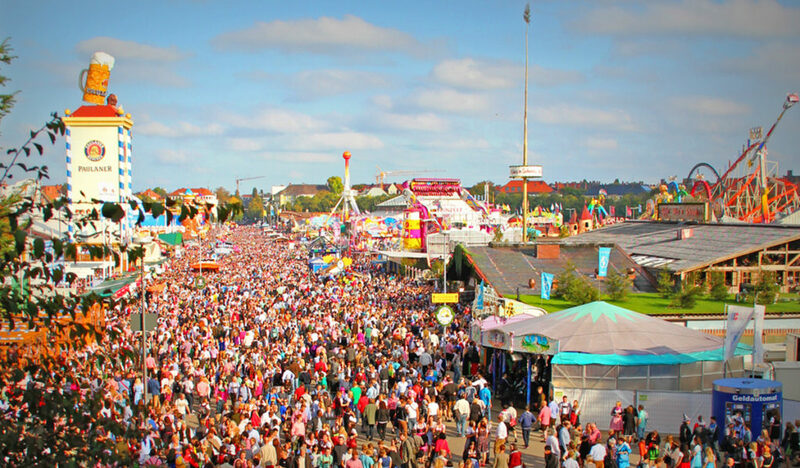 The 19th century original Munich event, a mix of a travelling funfair and a great beer festival, gave way to the numerous Oktoberfest celebrations that take place every year across the world. If you want to enjoy the best German beers, munch down on delicious bratwurst and practise your a�?ein beir, bitte!a�? with your traditionally dressed waiter, have a look at our list of top Oktoberfest 2017 events in the UK! If you can’t get to Germany for Oktoberfest then why not practise your German here, on UK soil?! London Oktoberfest is the biggest Oktoberfest in the UK with more than 50,000 guests attending each year since its start in 2011. The festival transforms Millwall Park (Canary Wharf) into a traditional Oktoberfest with a giant beer tent offering: special brewed Bavarian beer, the best Bratwurst, Schnizel and Pretzel this side of Munich, and live music from traditional Oompa bands. The entire family can also experience Bavarian culture for a day with their kid friendly Sunday Lunch special offers! Oktoberfest is back again in Leeds for two weekends in October. The South Bank Depot is the new central venue, just a few minutes walk from Leeds Train Station. This Oktoberfest celebration is the only UK based one to team up with HofbrA�u a�� one of the last traditional Munich breweries still in Bavarian ownership. Authentic German cuisine including bratwurst. brezel and hendl, and an in-house Oompah band providing a range of singalongs and classics, makes this an authentic Bavarian experience. Oktoberfest Brighton has a new home at The Level in Union Road and additional sessions this year after the success of their 2016 event. Book your place now and visit The Grand Bier Tent to enjoy the outstanding selection of hot and cold traditional German plates, steins full of craft bier as well as lively German music. ABK is the 2017 exclusive beer brewed at the same local German farms used by Aktien Brewery for over 700 years. Manchester Oktoberfest will bring you the feeling of being in an authentic Oktoberfest tent filled with long tables and benches in the middle of Manchester at Albert Square. Over one long weekend you can fully experience everything that makes a real Oktoberfest: live music by a German bands coming from Bavaria, delicious German food and fine beers, waitresses and waiters dressed in Dirndl and Lederhosen and even a giant outdoor beer garden! Bournevaria Oktoberfest 2017 transforms the BIC Solent Hall into a big Bavarian beer festival. The best German bratwursts and pretzels, accompanied by cold craft biers and a live band, will give you a genuine taste of Oktoberfest. Traditional German outfits are highly encouraged and there is a prize for Best dressed. Combine this with some of your best German expressions and you are bound to be in with a shot at the winner’s prize! Admission price includes a souvenir glass and a voucher for 50% off your first pint, so book your place and enjoy all the Bournevaria has to offer! Oxford has been twinned with the German city of Bonn since 1947. Now The Oxford-Bonn Link, an organization established in order to promote the partnership between both cities, is bringing the Oktoberfest to Oxford for a day. Join the Bonn Link for a fantastic night at the Oxford Conservative Club (New Road). Get ready to dance and sing German folk songs with the Oxford Oom-Pah-Pah-Lumpas band and dona��t forget to try the varied German nibbles and drinks. To find out more about learning German, or information on any of our courses simply call us on 01273 830 960 or email us. Our multilingual team will be happy to answer any questions you may have.